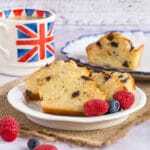 Give yourself a lunchtime treat with a homemade yogurt cake, made with tasty yoomoo frozen yogurt. Easy to make at any time in two varieties: berries, or chocolate chips from ingredients in your store cupboard and freezer. Something sweet to finish with as an occasional lunchtime treat is a real delight. Something a bit special, not just another piece of fruit, can really lift a meal from the everyday to noteworthy. These frozen yogurt mini loaf cakes are a perfect example; simple to make, they’re great to bring out when eating at home, and small enough to pop into a packed lunch for an on-the-go or at work treat. They’re just the thing to enjoy with that essential after-lunch coffee; a few minutes to treat yourself before diving headlong into a busy afternoon. 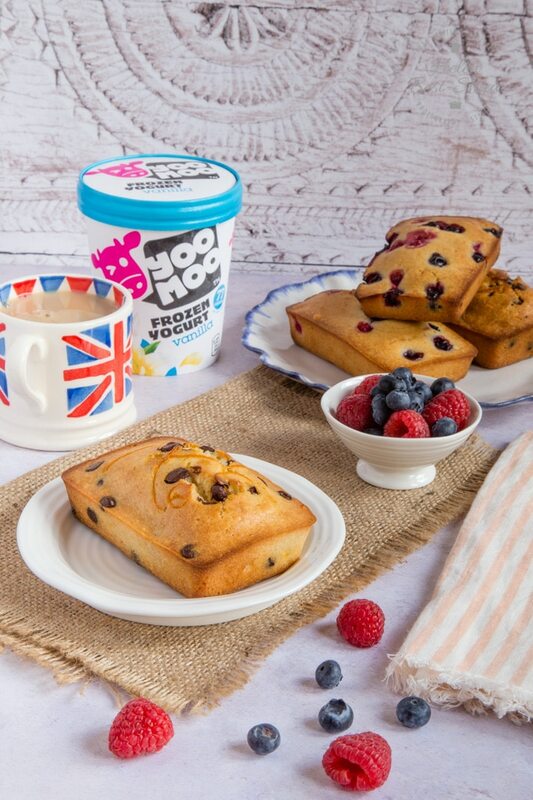 As a follow on from our frozen yogurt breakfast sundae recipe, these mini loaf cakes are made with defrosted yoomoo frozen yogurt. which gives a delicious hint of sharpness to the cake, but also means that it’s wonderfully moist. 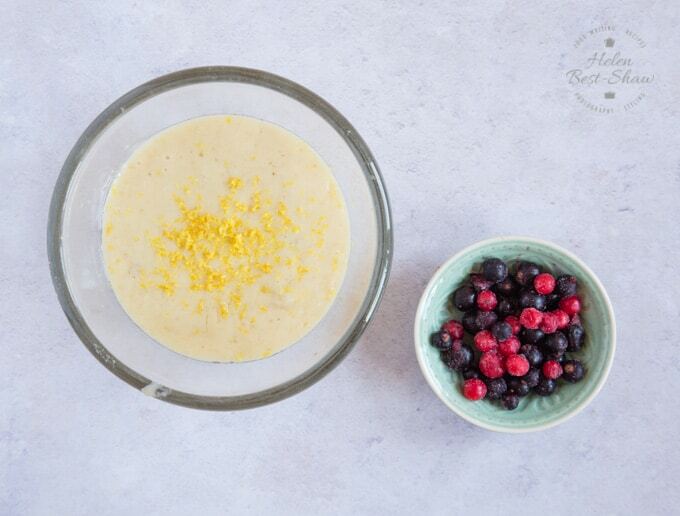 The other great advantage to this recipe is that the ingredients are always available in the store cupboard and yogurt and berries from the freezer, so it doesn’t use any fresh ingredients. Perfect for baking at any time! Mini loaf cakes like this are so much faster to cook than full size, just as delicious, and easier to add to a packed lunch, or take to an office bake sale or baking competition. And now is the perfect time to make this cake, as June is National Frozen Yogurt Month, so buying a pot of yoomoo, enjoying some as is, and using some to make this cake is a perfect way to join in! 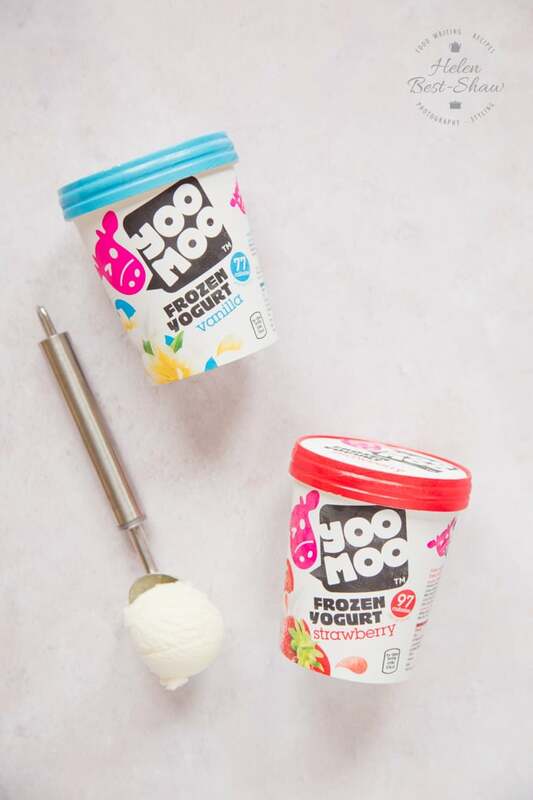 Should you be looking to mark the week but take a bit less time doing it, you can also enjoy yoomoo as frozen lollies in mixed berry, strawberry and tropical flavours. How do I Make Mini Loaf Cakes? First, measure out the yoomoo frozen yogurt, and let it melt. Second, heat your oven to 180C/Gas mark 4. Mix the dry ingredients (flour, sugar, baking powder and salt) in a large bowl. 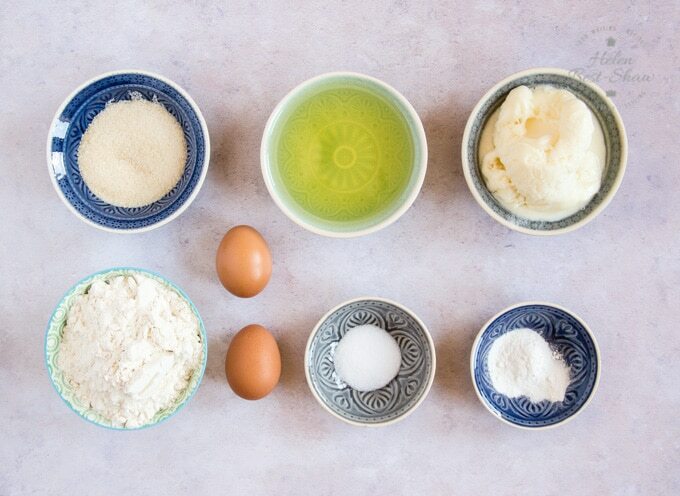 Third, add the wet ingredients: defrosted yoomoo frozen yogurt, vegetable oil, and eggs. Fold everything together. Fourth Prepare four small (12 cm) loaf tins, by greasing and lining the bottoms with baking parchment. Fifth Divide the batter mixture in half. Into one half, add most of the chocolate chips and grated orange zest. Fill two of the tins with the batter mixture and sprinkle the remainder of the choc chips over. If you have a citrus zester you can add a few strips of orange zest too. 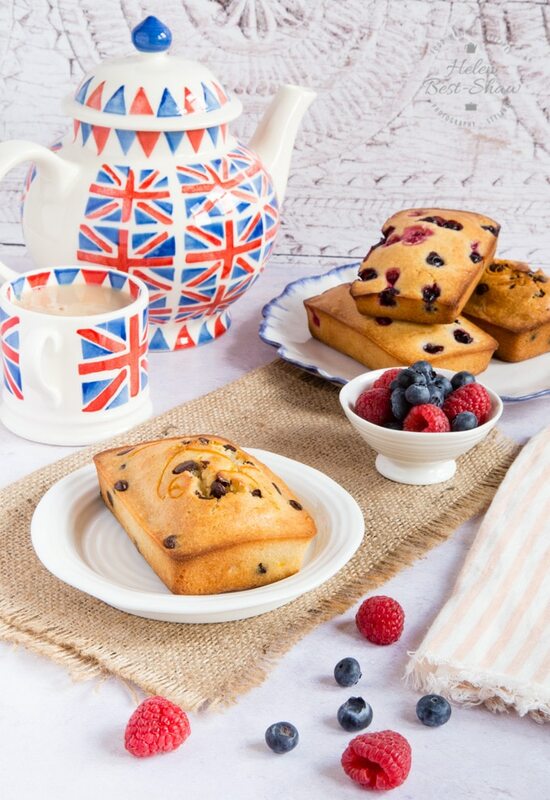 When it comes to the berry loaf cakes firstly select the smaller berries in the packet, half fill the tins, scatter most of the frozen berries over, then cover with the remainder of the mixture. This stops the berries sinking to the bottom of the tin, and also prevents the juice staining the batter. Scatter the last few berries over the top of the batter. Finally Bake for about 30 -35 minutes for the chocolate orange and 35-40 for the berry cakes, until done. Test with a skewer. If it comes out cleanly, the cakes are done. Cut reusable silicone baking parchment to size, and keep it in the clean mini baking tins. It makes for a faster preparation job when baking, and means no more baking parchment or cakes sticking to the tins. You can use fresh berries for this, choose smaller berries, or cut the larger ones up, and reduce the cooking time by 5-10 minutes. These mini loaf cakes keep in a tin for a few days, and are delicious sliced and served with a scope of yoomoo! Or serve along some my buttery croissants at brunch! 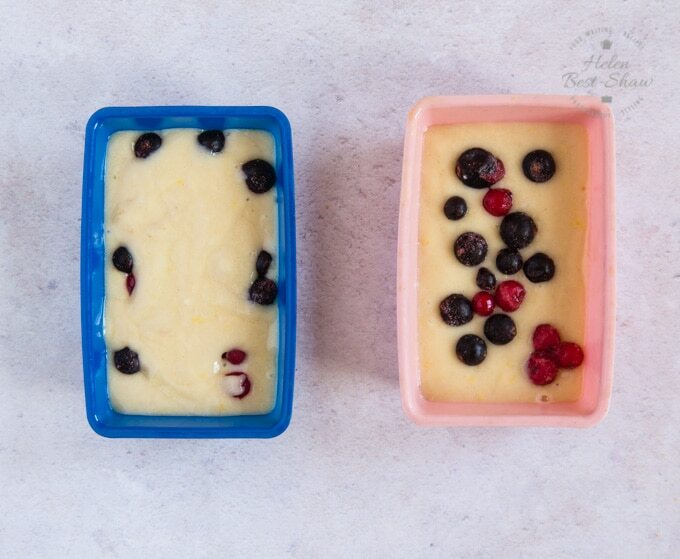 If you try this Frozen Yogurt Mini Loaf Cakes Two Ways please tag #FussFreeFlavours on Instagram or Twitter. It is amazing for me when for me when you make one of my recipes and I really do love to see them. You can also share it on my Facebook page. Please pin this recipe to Pinterest too! Thanks for reading Fuss Free Flavours! 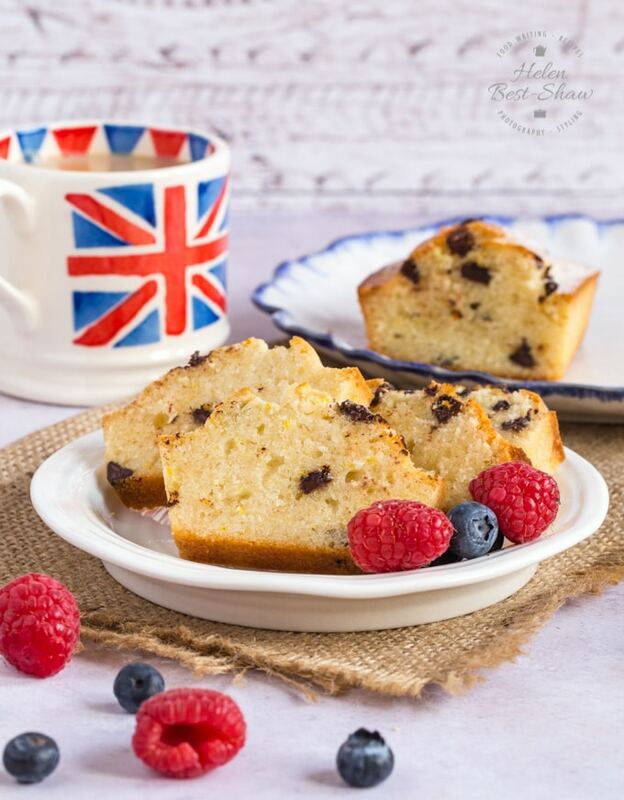 Give yourself a lunchtime treat with a home made mini yogurt cake, made with defrosted frozen yogurt. Easy to make at any time in two varieties: berries, or chocolate chips from ingredients in your store cupboard and freezer. Mix flour, sugar, baking powder and salt in a large mixing bowl. Add yogurt, eggs, and oil and fold the mixture together. Line and grease four small (12cm) loaf tins. Pour half the batter into another bowl. 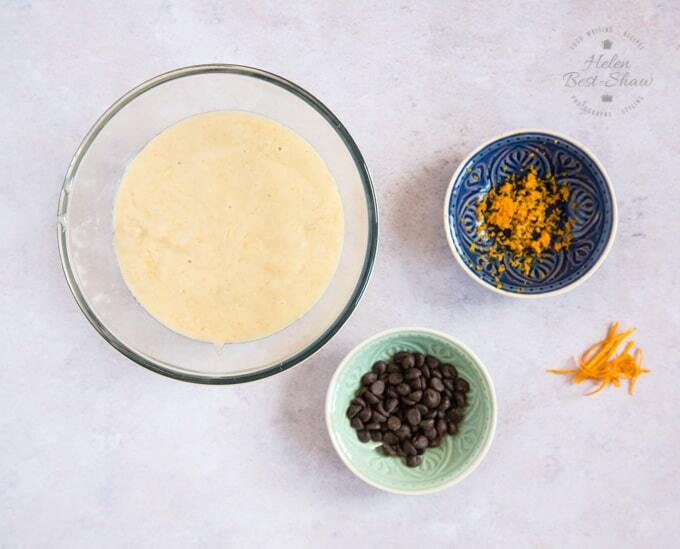 Into the first bowl, add the most of the chocolate chips and the grated orange zest. 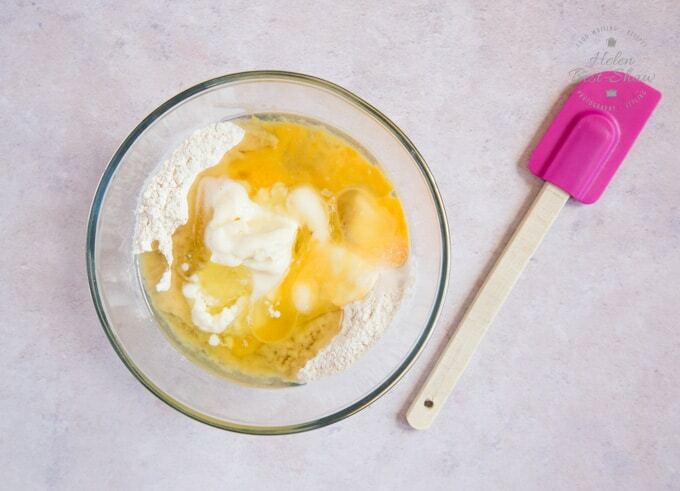 Pour this batter into two loaf tins. Top with the remaining chocolate chips. The chocolate chip cakes will take about 30 minutes to bake. Test with a toothpick: when comes out cleanly, the cake is done. Depending on your oven, you may need to cover the top with foil to stop the top burning. In the second bowl, stir in the lemon zest. Divide half of the remaining batter between two loaf tins. Sprinkle on most of the berries. Spread the remaining batter on top. By filling the tins this way, you avoid having the berries sink to the bottom and having the juice from the frozen berries "bleed" in to the batter. 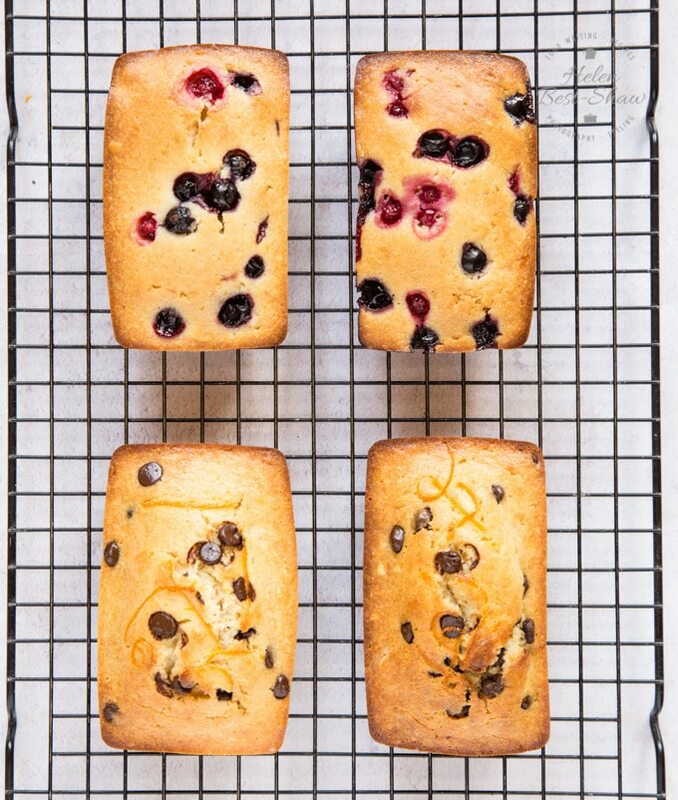 The cakes baked with frozen berries will take longer. Test after 35 minutes baking, but be prepared for another 5 minutes. Allow to cool for a few minutes before removing the cakes from the loaf tins. You could also bake this cake using yoomoo strawberry frozen yogurt and chopped fresh strawberries. It should take about 35 minutes to cook.